We had a great time hosting our very first “Client Appreciation Event – Family Day Aviation Experience”. Our most sincere thanks to Synergy Aviation, eyeLight Photography, Digital Video Listings, DQ, Bouncin’ Around, and Fabulous Faces for your support and ensuring our event was a huge success! “The Gist” is adapted from the REALTORS® Association of Edmonton Monthly MLS® Report and Press Release. Every month I summarize and post “the gist” of the MLS® data for Edmonton and area real estate activity. The average*** single family detached price in the service area of the Edmonton Multiple Listing Service® was down 0.97% to $416,859. We value your privacy. As such, it is our policy that personal information such as your name, postal and/or e-mail address, or telephone number is private and confidential. We may use your personal information, including information collected from our social media sites, to send you communications you have requested to receive and/ or to respond to your questions and comments. We may use your email address and all of the information you provide in order to provide you with guidance, suggestions, and service in your efforts to either sell or buy real estate. We at all times adhere to applicable legal or regulatory requirement(s) concerning the storage and protection of personal information. The data relating to real estate on this web site may come in part from the MLS® Reciprocity program of the REALTORS® Association of Edmonton. Data is deemed reliable but is not guaranteed accurate by the REALTORS® Association of Edmonton. 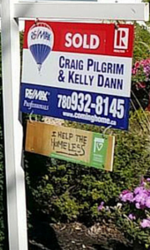 Copyright 2019 by the REALTORS® Association of Edmonton. All rights reserved - Listing data updated on April 20, 2019.